I had an incredible week of dance making and math making with 160 fourth graders. Yes, that's five classes of 32 students. Every day for five days. And, yes, I was tired, but it was totally worth it. It was worth it even before I got a packet of incredible letters from one of the classes, but what I found written there showed me just how impactful this week really was. For just a little context, this was the ideal Math in Your Feet residency. The teachers were all on board and supportive during the dance classes, which makes a huge difference in students' learning. And, they also made time to have the kids work in their residency journals, with special attention to the daily reflection prompts and word studies which also makes a huge difference. The classes were filled with enthusiasm for making and learning. By the end of the five days it seemed that almost every student had moved forward in their understanding of and skills in both the dance and math. There was one class, though, that seemed to struggle more than the rest. Their attention would wander and, when I talked, they seemed to need lots of time to process my words. It took me until the final day to feel like I was making a connection with them. So, it really was success when, on that final day, almost all the students in that class were able to perform their final original 8-beat pattern. 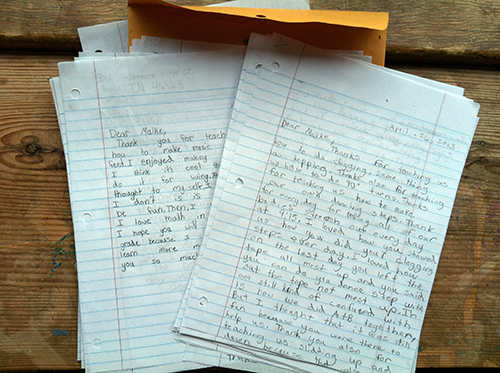 But when I read the 32 beautifully hand-written letters from the students in this class I knew it was more than success, I knew it was an out and out victory. I mean, just listen to their reflections! They are filled with descriptive details of personally relevant learning and understanding of program topics. I loved that the program was hard for them and, at the same time, a challenge that they wanted to meet. Most of all, I loved getting their letters and being able to hear so clearly what was important to them about this experience. As a visiting artist, here one week, gone the next, there isn't always a chance to get this kind of feedback. And for that, I am am completely grateful to their teacher. Thank you Mrs. Trent! !